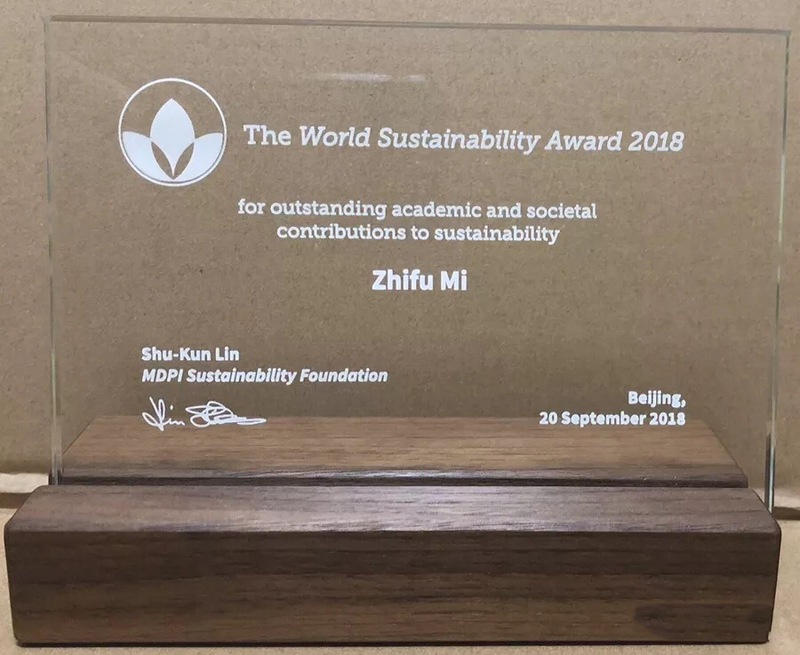 Dr. Mi Zhifu, a Ph.D. graduate of CEEP, won the 2018 World Sustainability Award. The co-winner is Dr. Mathis Wackernagel, founder and chairman of the Global Footprint Network. Mi Zhifu and Mathis Wackernagel will share a $100,000 prize in recognition of their academic and social impact in carbon footprint and ecological footprint research. 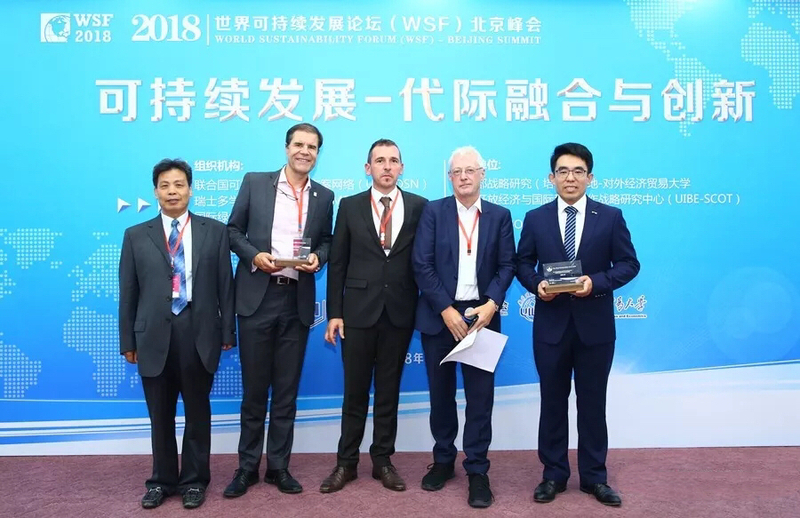 Mi Zhifu was invited to give a special report on consumer carbon accounting methods and applications at the Beijing Summit of the World Sustainability Forum. The World Sustainability Award, supported by the UN-SDSN, is funded by the Swiss Multidisciplinary Digital Publishing Group to encourage individuals or organizations that make outstanding academic and social contributions in the sustainable arena. No more than three winners are awarded this prize each year. Sustainability is understood as the interdependence of the economy, society and the environment to achieve mutually beneficial development for different regions and the globe. Sustainability involves multidisciplinary research and is committed to achieving the UN Sustainable Development Goals. The World Sustainability Award is announced annually at the World Sustainability Forum. The forum is held in China for the first time this year. Former Deputy Secretary-General of the United Nations Sha Zukang, Director of the United Nations Network for Sustainable Development Solutions Jeffrey Sachs, Deputy Head of the Swiss Embassy in China Alain Gaschen, President of the University of Economics and Business Wang Jiaqiong, President of the International Green Economy Association Deng Jihai all participated in this forum. Last year the World Sustainability Forum was held in South Africa. The winners were Professor Jeffrey Sachs and Dr. Sonia Sachs from Columbia University. About the winner: Dr. Mi Zhifu, currently working at the University of London College of Technology (UCL), Bartlett Construction and Project Management Institute, is the associate editor of the SCI Journal of Cleaner Production (influence factor 5.651). His research interests include climate change economics, energy policy, and input-output analysis. In the past five years, he has published more than 30 SCI/SSCI papers in journals such as Science Advances, Nature Geoscience, and Nature Communications, including 5 ESI hot papers and 11 ESI high-cited papers. He also won the 2015 Highly Cited Original Paper Award by the Applied Energy and Environmental Research Letters 2017 Best Young Scholar Paper Award. He was once invited by Oxford University Press to write a literature review about comprehensive climate change assessment model. Besides, he was invited to participate in the United Nations Conference on Sustainable Development (Brazil, 2012) and the United Nations Climate Change Negotiations Conference (Peru, 2014; Morocco, 2016). In addition, he is a guest editor of Applied Energy (SCI), Mathematics and Computers in Simulation (SCI), Structural Change and Economic Dynamics (SSCI).